The 2018 college football season officially starts tonight with 12 games, including a primetime matchup on ESPN between Purdue and Northwestern. The Boilermakers are coming off a season in which they had the largest increase in attendance in the country, with more than 13,000 more fans packing Ross-Ade Stadium last year on average than in 2016. After a 7-6 campaign that ended with a rousing bowl victory, the atmosphere in West Lafayette tonight seems likely to be more electric than at any time since the Joe Tiller Era. With a raucous crowd filling the stadium, Purdue can make an early statement about its return to relevance in the Big Ten. Coach Jeff Brohm has talked about this game as an important one to keep the momentum of the program going. The schedule is mostly backloaded this season, with games against Ohio State, Wisconsin and Michigan State in the season's second half. That makes these early games, especially the four straight at home to begin the season, all the more important for the Boilermakers as they try to reach back-to-back bowl games for the first time since 2011-12. This game will also serve notice about the state of the Big Ten West race. Almost every expert (and me, although I probably don't count as an "expert") expects Wisconsin to win the division handily, but the winner of tonight's game will likely be the team with the best shot at toppling the Badgers. The Boilermakers get Wisconsin at home on Nov. 17, just for future reference. On the field, the matchup could come down to which team's injured players are able to play at closest to 100 percent. Northwestern quarterback Clayton Thorson is coming off a torn ACL suffered in the Wildcats' bowl game and it's unclear whether he'll be able to go, but the Boilermakers have prepared as if he'll be the starter. On the Purdue side, wide receiver Jared Sparks is dealing with an ankle injury, but Brohm said he'll at least try to play. At running back, DJ Knox, Markell Jones and Tario Fuller are all nicked up and it's unclear how effective each will be. Considering those are Purdue's top three backs, it could be a problem. I've written extensively about Purdue's young defensive line and linebackers and today they'll be thrown into action with no FCS opponent to warm up against. 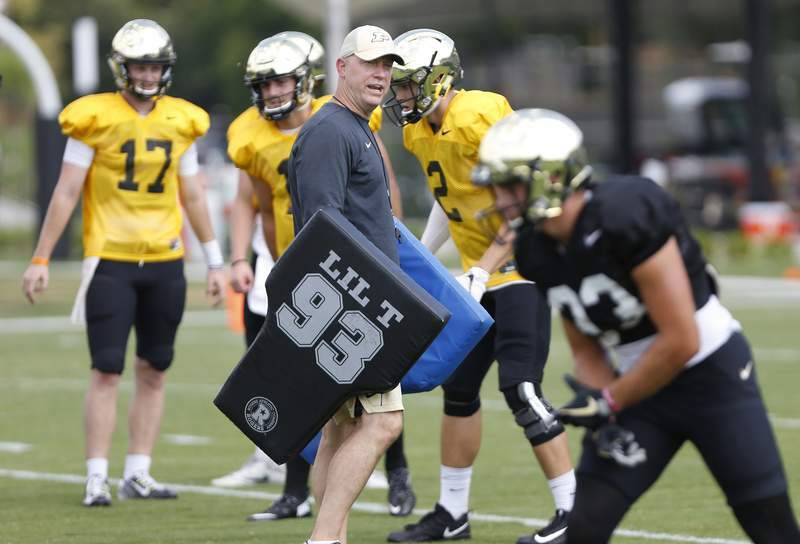 Defensive coordinator Nick Holt has said he'll keep the gameplan simple, but with three almost completely inexperienced starters on the defensive line, it's really anyone's guess how the pressure of such an important game will affect their performance. With Jeremy Larkin looking like a capable replacement at running back for the Wildcats' departed star Justin Jackson, the game could come down to how well those young linemen handle their first significant opportunity in college football. What to watch for: For Fort Wayne fans, the time to watch is when Northwestern has the ball. When the Wildcats have possession, there will be two Summit City natives on the field for most plays. Purdue's Antonio Blackmon, a Bishop Dwenger grad and former walk-on, has played his way into a starting spot at cornerback for the Boilermakers opposite top corner Tim Cason. If the talented Thorson plays, Blackmon will be in the spotlight. Also getting plenty of attention will be former Homestead star Bennett Skowronek, who was one of Thorson's favorite targets at wide receiver last year. Skowronek caught seven passes for 117 yards against the Boilermakers in 2017 and there's a possibility he and Blackmon might square off against each other on certain plays.